Geocaching, the thrill of the hunt! When Bob Speik called to tip me on Geocaching, I knew it was the real deal. Speik, a widely know wilderness-skills instructor who came honestly by his nickname - techno ranger - had discovered a fun outdoor adventure activity that combines his passion for navigation with his love for getting out and trudging through the puckerbrush. And Speik is not the one to keep this sort of thing under his Stetson. When we met east of town, Speik introduced me to Paul Chance, a computer whiz who also likes to stumble around Central Oregon's backcountry and find stashed treasures with only his wits and a well calibrated GPS unit. Which, in a nut shell is what Geocaching is all about. You get the coordinates of a cache - either directly off the official Geocaching Web site (www.geocaching.com) or from a clue obtained there - and then you set off in search of a small plastic or metal container brimming with inexpensive baubles such as toy frogs, Space blankets, coin purses and those little folding scissors good for trimming nose hairs and the hackle on a shaggy Prince nymph. Some caches contain "hitchhikers," an item that you can move from cache to cache. One such trinket has traveled from Australia to Arizona, according to those who know. In essence, you never know what you're going to find. Of course, the actual finding is not the entire point anyway. It's the mystery, the thrill of the chase, the blend of panic and exhilaration that comes from knowing exactly where you're standing on this crazy planet of ours (within 20 feet or so) but having absolutely no idea where you parked the rig. And, yeah, it is awfully exciting to zero in on the cache, get on your hands and knees and spy something deliciously out of place under a fallen log. It's terribly satisfying to feel the heft and texture of dusty Tupper-ware in your hands and then pop the lid for a little look-see. Leaving everything to Chance, we followed him up the trail toward the top of Pilot Butte to find our first cache of the day (and my first ever). Then we drove out a little ways east of town to find one on a patch of public land. Like potato chips and disc golf, one cache begets another. So, after finding the second we moved on to the Deschutes River west of Bend to try to find a couple more. There's nothing quite like honing in on your target, head down and GPS ticking off the distance: .37 mile, .25, 300 feet, 100 ... And then finding the cache, usually concealed beneath a log or rock with just a small portion visible, examining the contents and either exchanging items or simply adding to the treasure. We signed the log book found with each cache with our official Geocaching nicknames (Cougarmeat, Baron Max and Redsides1) and made our way back to the Jeep each time as best we could. Each time we intended to enter the location of the Jeep in at least one GPS and each time each of us forgot. It's easy to get carried away with the hunt, look up and have very little idea of how you got where you are. 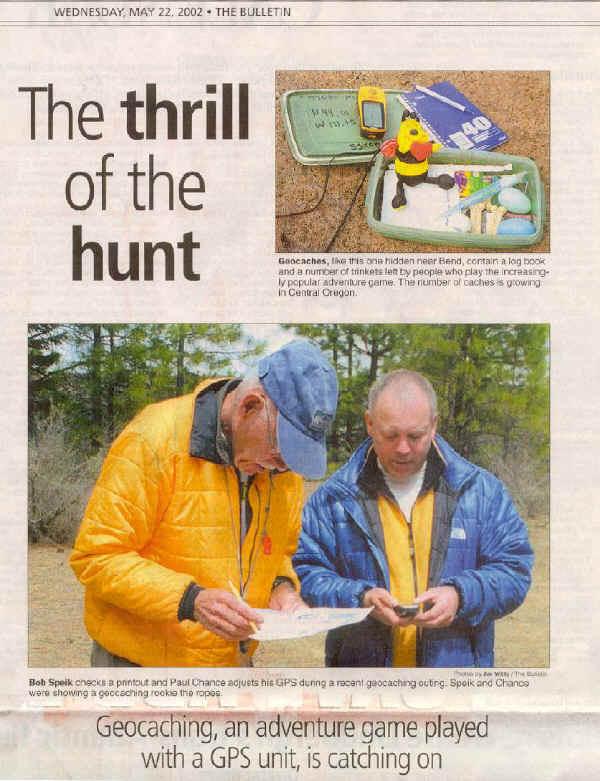 According to Speik and Chance there are more than 190 caches within 100 miles of Bend's zip code. According to www.geocaching.com, there are an estimated 16,000 caches hidden in 116 countries. "It's more of a game than a sport," said Chance who admits he's addicted. "You get to visit areas you may never have been before ... The price of admission is the price of a GPS unit." Which is less than $120 for the Garmin eTrex model, the unit Speik recommends. "The spirit is to hide these somewhere that whether or not the person finds the cache it's a great place to be," said Speik. "It's really conducive to a social thing. One person drives, the other looks at the GPS." RESOURCES: A decent GPS device costs under $120. The one-stop online resource is www.geocaching.com. To learn more about map, compass and GPS, visit www.TraditionalMountaineering.org. THINGS TO REMEMBER: Since this is an outdoor activity that takes you into remote areas, use common sense. Remember to tell a reliable person where you're going and when you plan to return, and carry extra clothing, water, food, a map, compass, a cell phone and other essential survival gear. And don't forget to mark where your vehicle is on the GPS unit. It's easy to lose your bearings on the way back if you were single minded about your quest on the way in.